TICKETS FOR DISNEY ON ICE PRESENTS TREASURE TROVE PRESENTED BY STONYFIELD YOKIDS ORGANIC YOGURT NOW ON SALE! 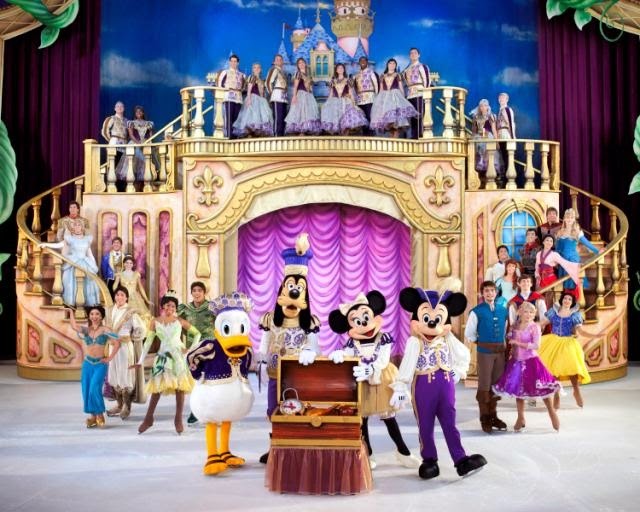 New Disney On Ice Show Comes to Bridgeport, CT January 8th-11th & Hartford, CT January 14th-18th. Disney On Ice presents Treasure Trove Presented by Stonyfield YoKids Organic Yogurt sets the gold standard with a magical medley of Disney tales in one jam-packed ice show that commemorates the legacy of Disney animated films. This skating spectacular visits Bridgeport's Webster Bank Arena from January 8th-11th and Hartford's XL Center from January 14th-18th. Tickets are now on sale. Get tangled up in Disney's 50th animated feature with Rapunzel and Flynn and enter the worlds of your other favorite Disney princesses –Tiana, Cinderella, Jasmine, Ariel, Sleeping Beauty, Belle, Mulan and of course, the one who started it all, Snow White. Ahoy, Mateys! Set sail with Peter Pan, the always sassy Tinker Bell and the cantankerous Captain Hook and his pirate pals on an adventure beyond Never Land! Trek the wilds of Africa with Simba, Nala, Pumbaa and Timon as they discover the true meaning of the "Circle of Life." Tick-Tock! Tick-Tock! Don’t be late to a very important date with Alice and the Mad Hatter as they march with the Queen of Hearts’ Army of Cards. Relive magical moments in this ultimate Disney animation celebration coming to Bridgeport, Ct and Hartford, Ct.
Feld Entertainment invited my family to be their guest at Disney On Ice: Treasure Trove Opening Night in Hartford, January 14, 2015. I am so excited to share our visit, so please stay tuned! And in the meantime, enjoy these Trivia questions, video and GIVEAWAY! Yes, you read that right. Where does Peter Pan tell Wendy Neverland is located? What does “Hakuna Matata” mean? Who wished Alice a Happy Un-Birthday? According to Cinderella, what is one thing even her evil stepmother can’t order her to stop doing? Feld Entertainment is giving TWO of my lucky followers the chance to win a Family 4 pack to Hartford's Disney On Ice Treasure Trove Show, These tickets are for Hartford's opening night, January 14th @ 7pm. Two (2) winners will receive: A Family 4 pack to Disney on Ice Treasure Trove, Hartford's opening night show (January 14th @ 7pm). Must be 18 years or older to enter. Ends 1.11.15. To learn more about Disney On Ice Presented by Stonyfield YoKids Organic Yogurt, go to www.DisneyOnIce.com, or visit them on Facebook and YouTube. My girls would go crazy!! Ariel for sure!! My girls would both LOVE this! Little mermaid! We love Disney!! Captain Hook and the princesses! Most excited to see Lion King!